In 2014 we began the tradition of looking back each year at the vintage from ten years before. Part of this is simple interest in seeing how a wide range of our wines -- many of which we don't taste regularly -- have evolved, but we also have a specific purpose: choosing ten or so of the most compelling and interesting wines from this vintage to show at the public retrospective tasting we're holding on February 20th. Ten years is enough time that the wines have become something different and started to pick up some secondary and tertiary flavors, but not so long that whites are generally over the hill. In fact, each year that we've done this we've been surprised by at least one wine that we expected to be in decline showing up as a highlight. 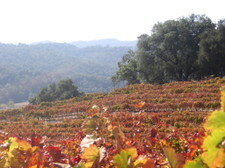 The 2006 vintage was a study of contrasts, with a cold, wet start, a very hot early summer, a cool late summer and a warm, beautiful fall. 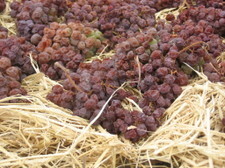 Ample rainfall in late winter gave the grapevines plenty of groundwater, and produced relatively generous crop sizes. 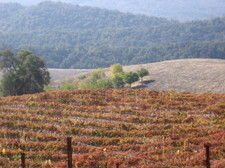 The relatively cool late-season temperatures resulted in a delayed but unhurried harvest, wines with lower than normal alcohols, strong varietal character, and good acids. White wines show freshness and expressive aromatics, while red wines have impeccable balance between fruit, spice, and tannins, and should age into perhaps the most elegant wines we've made. I was interested in the extent to which we'd still see what we'd noted when the vintage was younger. Would the wines (red and white) show the elegance that we thought we might find? Would this vintage of moderate concentration (sandwiched between two of our most powerful vintages) have retained the stuffing to make them compelling a decade later? And were there any lessons we might take for the wines we're making now? 2006 Vermentino (SC): A nice nose of green fruit (maybe quince? ), crabapple and petrol, with a stony/minerally note. In the mouth it was fresh, medium-weight, with nice acids and flavors of apple skin and watermelon rind. The finish was notably saline, with a yeasty note like aged Champagne. 2006 Grenache Blanc (SC): An effusive nose of candied grapefruit, apple pie, and sea spray. The palate was rich with glycerine but cut by a salty mineral note that reminded me of saltwater taffy. Flavors of preserved lemon and anise softened into a long and rich finish with a sake-like creaminess and a hint of menthol. I loved this wine, though the group was less excited, with a few complaints as to the wine's heft (it was 15.3% alcohol) and thoughts that it could have used a touch more acidity. Still, long after I'd expected this wine's natural life to end, it was a treat to taste. 2006 Viognier (SC): A bright, herby nose of tarragon and sage, with some lemon peel and candied pineapple coming out as the wine opened in the glass. The mouth was really nice, salty, not particularly fruity, with crunchy nectarine and some citrus pith flavrs. The finish was clean with good acids. It didn't play at all in the typical Viognier blowsy profile, instead much more linear and mineral. My dad said it reminded him of "older Chateau Grillets" (a monopole producer of Viognier in the northern Rhone). 2006 Antithesis Chardonnay (C): A deeper color and aromatic profile than the previous wines, with aromas of cedar, maraschino cherry, and butterscotch. The mouth was still holding on pretty well, showing some oak, a very rich texture, and some ripe apple. A little heavy on the finish. A warm-climate rendition of Chardonnay, at the end of its life but still alive, but almost certainly better when it was younger. 2006 Cotes de Tablas Blanc (SC; 59% Viognier, 32% Marsanne, 6% Grenache Blanc, 3% Roussanne): The nose shows an herby peppered citrus Marsanne note (more than Viognier, despite its predominance in the blend). On the palate, lots of sweet fruit, like honeydew melon and mint, then a long, soft finish of chalky minerality and marshmallow. Still showing nicely, though a touch low in acid. I like what the higher Grenache Blanc percentages we're using now on this blend bring to the table. 2006 Bergeron (SC): Made from 100% Roussanne, harvested a little earlier from cooler blocks around the vineyard. The nose was initially somewhat neutral, with a little tart green kiwi fruit coming out with time. The mouth is medium-bodied, somewhat neutral as well, with good acids and nice minerality. The finish came across as a touch sour, with a watermelon rind note. A bit unexciting now, though we all remembered liking it quite a lot when it was young. 2006 Roussanne (C): A first bottle was oxidized, but the second bottle was gorgeous: a medium gold color, with a stunning nose of orange peel, lilac, bit-o-honey, and something minty (tarragon, maybe) giving lift. On the palate, the wine was rich, long, and caramelly but fully dry. The finish was candied orange, citrus blossoms, and a nice saltiness that provided freshness. Really impressive, if you like white wines with power and density. 2006 Esprit de Beaucastel Blanc (C; 65% Roussanne, 30% Grenache Blanc, 5% Picpoul Blanc): The nose was higher toned than the Roussanne, with an appealing bit of Grenache Blanc's austerity: pink grapefruit to go with the honey and herbs. The mouth shows a good balance between sweet fruit and fresh acids, with white flowers, quince, and peach juice. There are some signs of age but the wine is in a very nice place. 2006 Rosé (SC; 60% Mourvedre, 28% Grenache, 12% Counoise): A pretty deep amber-pink color. The nose is like a light red, with bing cherry and wild strawberry. The mouth is rich and luscious, with lots of grapey, plummy fruit. There are still some good acids, though the wine finishes heavy at this age. Not really a style of wine any of us drink, but still interesting to taste. 2006 Counoise (SC): Quite dark for a Counoise. A classic rustic Gamay-reminiscent nose, with peppered raspberry and cured meat. The mouth is really nice, with spicy red plum fruit, still quite light on its feet. A clean, youthful finish with still some noteworthy tannins. Plays much more youthful than its ten years of age, and made us all think we're underestimating Counoise's longevity. 2006 Cotes de Tablas (SC; 72% Grenache, 11% Syrah, 9% Mourvedre, 8% Counoise): Under screwcap, a bright, clean nose of raspberry fruit. The mouth was medium-bodied, with strawberry and plum flavors, nice baker's chocolate tannins, and a bright finish. Tasted very youthful. 2006 Cotes de Tablas (C; 72% Grenache, 11% Syrah, 9% Mourvedre, 8% Counoise): Under cork, the same wine tasted totally different. A deeper nose, more mocha than chocolate, with the fruit aspect more stewed than fresh. On the palate, deeper, chewier, more full-bodied and older: tasted fully mature, with less life left but more depth. Like a 10-year-old wine. 2006 Grenache (C): A lovely meaty animal and red fruit nose. The mouth was gorgeously balanced between sweet strawberry fruit, salty mineral, chocolatey depth, and earthy funk. Showed good acids and some tannins yet on the finish. A pleasure. 2006 Mourvedre (C): A nose of roasted meat drippings, milk chocolate, red cherry and currant. The mouth is again beautiful, with great balance like the Grenache, a bit more weight, and a little longer and plusher (showing less acidity) on the finish. Chelsea commented that it had "the right amount of unruliness" which seemed right on to me. A beautiful showing for this wine. 2006 Syrah (C): The nose is meaty, with a little peppered bacon. The mouth is still quite youthful, with fairly big tannins still, and a savory finish without the generosity of the two previous varietal wines. We liked the nose more than the palate at this stage, and thought that the wine was really still too young. 2006 Esprit de Beaucastel (C; 45% Mourvedre, 28% Grenache, 22% Syrah, 5% Counoise): Fascinating to taste after the three varietal wines, as it shows aspects of each. A pretty nose of meat drippings, Provencal herbs, and balsamic marinade, with something cool and spicy (juniper?) behind it. The mouth is rich and tangy, with sweet fruit and nice herbs, a meaty, chocolatey aspect, good tannins, and a clean, long finish. It was still, we thought, on its way up, and fleshed out with time in the glass. Decant this if you're opening it now. 2006 Panoplie (C): A deep, dark, brooding nose of marinating meat and roasted root vegetables. The palate shows sweet black fruit (black fig and black cherry), nicely tangy, plush and luscious. Tannins are still big, but necessary with all the richness and body. Chelsea said "if I was going to take a Panoplie home to my parents, this would be the one." Impressive, from beginning to end. 2006 Tannat (C): The nose was higher toned than we were expecting, with a yeasty chocolate souffle note. The mouth was really nice, with milk chocolate, salty and tangy aspects. The tannins were pretty resolved for a Tannat, and the flavors as much red as black. Mature, we thought (in contrast to the 2005, which still felt very young a year ago). 2006 Vin de Paille (C; 40% Grenache Blanc, 23% Viognier, 20% Roussanne, 17% Marsanne): The nose felt a little unsettled, with poached pear, spice, and a slightly volatile potpourri note. The palate was quite sweet, and still quite primary: peach syrup, candied violets, roasted pecans, and some welcome acids on the finish. 2006 Vin de Paille Quintessence (C; 100% Roussanne): A deeper and more savory nose than the straight Vin de Paille, with intense essence of apricot, golden raisins and molasses. The mouth was sweeter but also more textured and with more acid than the Vin de Paille blend: really rich and powerful, and long, long, long. Tyler's comment was "I might not open a wine like this often, but if I wanted to show off to friends, I would". 2006 Vin de Paille Sacrérouge (C; 100% Mourvedre): Compared to the two white vin de paille wines, the nose is savory, with saddle leather, black olive, and chocolate-covered cherries. The mouth is younger than the nose, sweet with fig and date flavors, but medium-bodied. Some tannins show up on the finish. Still young, we thought. I was very happy, overall, with how the wines showed. This was the most different varietal wines we'd bottled to this point, including our first-ever Grenache, and I was happy with how well -- and how much varietal typicity -- they all showed. However, compared to our tasting of the 2005's, there were more wines that tasted like they were on the downslope (Antithesis, Bergeron, Rosé), and some wines that were fully mature whereas in 2005 they were still youngish at ten years of age. But the elegance of our principal wines, including both Esprits, and the power of wines like the Panoplie, Roussanne, and Vin de Paille Quintessence, suggests that the best wines from 2006 are among the best we've ever produced. I thought that tasting the Esprits after their principal components was the most interesting aspect of the tasting. The Esprit Blanc showed both its Grenache Blanc and Roussanne aspects, in a way that complemented each. And the Esprit red showed how each of its components combined to make something none of the parts could have achieved individually. This tasting was yet another data point for me suggesting that Syrah really needs time. This 2006 was still, I thought, too young, and it was the tannins and structure of the Syrah component that kept the Esprit red feeling younger than either the varietal Grenache or the varietal Mourvedre. I guess this shouldn't be surprising given that Syrah-based wines from the northern Rhone and Australia are among the longest-lived wines in the world, but I'm concluding that a decade in, ours still want a longer rest. The cork/screwcap contrast on the Cotes de Tablas was really fascinating, and provoked the most discussion around the table. We split evenly as to which we preferred, with some people opting for the depth and weight of the cork finish and other choosing the clarity and vibrancy of the screwcap finish. I preferred the brightness of the screwcap, but I totally understand why others (including my dad) preferred the cork. If this sort of thing interests you, you might want to check out my older blog Bottle Variation, Very Old Wines and the Cork/Screwcap Dilemma, spurred by a conversation with Bonny Doon's Randall Grahm in which he posits that most wines, in the long run, probably do benefit from screwcap's protection from oxidation. Of course, the $100,000 question is whether most wines are drunk before that point or after. Finally, we chose ten pretty exciting wines for what should be a great February 20th Horizontal Tasting: Viognier, Roussanne, Esprit Blanc, Cotes de Tablas (screwcap), Cotes de Tablas (cork), Grenache, Mourvedre, Esprit, Panoplie, and Vin de Paille "Quintessence". I hope many of you will join us! 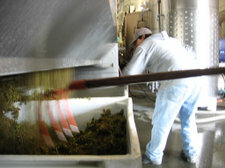 Well, 315 tons and 50 days after our first grapes came in, we've finally finished Harvest 2006. Three weeks ago, if you'd told us that we'd look back on the 2006 harvest with excitement, we'd have thought you were crazy. The first half of October was cool and cloudy, and rained a couple of times, and with only about 30% of the harvest in, we were worried that this would be the first disappointing harvest since 2001. However, the last three weeks turned the vintage from a potential disappointment to one of the best we've seen. 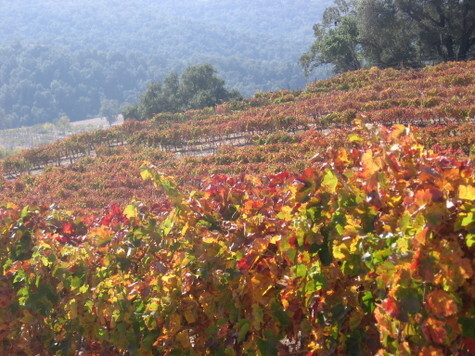 Perfect fall weather, with daytime highs in the 70s and 80s, nights in the 30s, and consistent light breezes gave us the opportunity to leave grapes on the vine until the last moment. 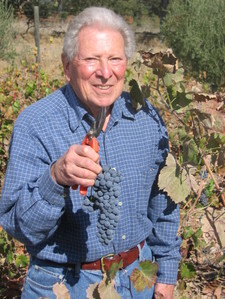 At right, Robert Haas holds the last bunch of Harvest 2006: a Mourvedre bunch from the section of head-pruned vines next to the winery. 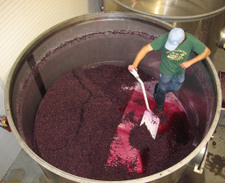 As we bring the grapes from the last few sections of the vineyard into the cellar, we make space in our tanks by pressing off some lots that were more precocious. With the beautiful weather we've been having, this sometimes makes for some nice scenes. 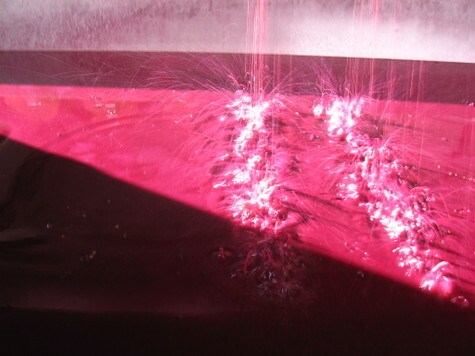 The shot below is of the juics from a press load of Mourvedre, lit by sun streaming through the open winery door. Well, fall is here. We're into a cycle of weather where we come near a frost at night (we've actually dropped below freezing a couple of times) and then rise up into the 70s and 80s during the day. 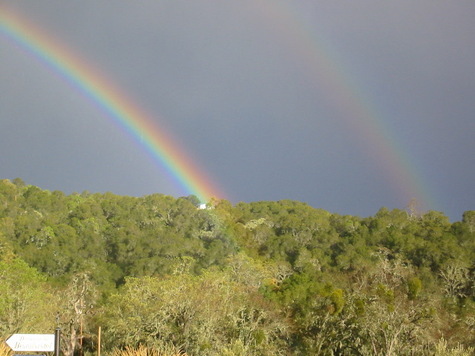 It's Paso Robles at its most spectacular. This week has been as productive as we had hoped, and we have brought in over 100 tons of grapes. The weather has been perfect, with days in the upper 80s, clear skies, and a good breeze. 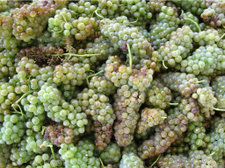 We've brought in the Grenache and Grenache Blanc, and most of the rest of our Roussanne and Marsanne. 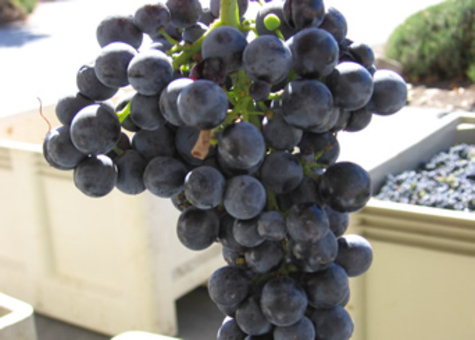 With good weather forecast into next week, we're going to wait on the Mourvedre (a sample bunch is pictured above; note the still-green stems and the relatively inflated berries). We decided that we could pick the Mourvedre if bad weather threatened, but with more sun in store, we feel that it will be even better if we wait. So far, so good... excellent depth of flavors, good intensity, smaller berries than 2005, and good concentration at slightly lower sugar levels than past years. Excellent! We're enjoying probably the last relatively mellow day before harvest starts in earnest. From sampling we have done, it looks like we're going to see significant amounts of Syrah, Viognier, and Grenache Blanc this week. Ripening is proceding under ideal conditions: low-90s daytime temperatures, upper-40s nighttime temps, full sun, no humidity, and light Santa Ana winds from the south. Each year, we make a little early-picked, cool-microclimate Roussanne in the style in which it's made in the Savoie region in France (where the Roussanne grape is known as "Bergeron"). This citrusy, higher-acid version of Roussanne is great with fresh seafood, oysters on the half-shell, and fresh cheeses. We have more details in out 2005 Harvest Report. 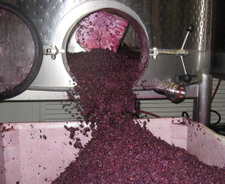 Above, see the Bergeron in its picking bin, and then a great shot of cleaning the skins, seeds, and stems out of the press after pressing. The Bergeron is the sort of wine that we make exclusively for our VINsider Wine Club members. It's typically made in 200-300 case quantities, and isn't something that we would market nationally. But, we think it's a great take on the Roussanne grape, and has proven to be exceptionally good with food. Try it with aged cow's milk cheeses!